This month we look at securing your caravan at home whilst out of use. 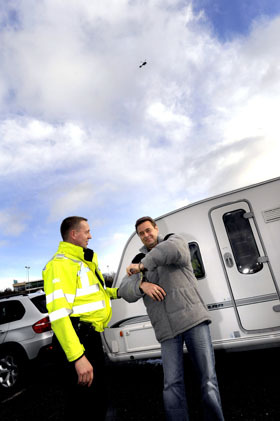 We last reported on caravan security back in mid 2012 when caravan theft claims were falling. After a decade of high thefts, the last few years had seen a significant drop in claims. It wasn’t until late last year and throughout 2013 that claims for stolen caravans, equipment theft and attempted theft began to slowly rise again. For any caravan owner the thought of having someone come on to their property and vandal, steal (or attempt to steal) their pride and joy is unthinkable. But the truth is it can and does happen to thousands of camping and caravanning enthusiast each year . 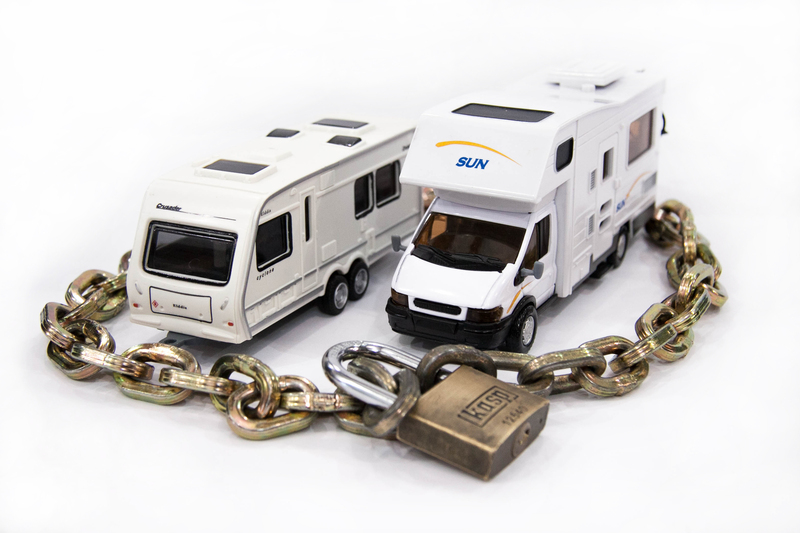 We recently revisited our claims archives and discovered that 26% of all caravan thefts or attempted thefts made between 2010 and 2013, occurred when the caravan was stored or parked at home. Knowing what we know about theft claim patterns, we recommend that customers take the time to assess whether their home storage location is fit for purpose and as theft-proof as possible. Security posts (sometimes known as drive posts, hitch posts or parking posts) are one of the more common types of caravan security. They act a deterrent for thieves and make it difficult for trespassers to take the vehicle off the drive. Posts don’t have to cost the earth either, prices can start from around £50. Padlocked or chained gates are another great way to prevent thieves and vandals getting close to your vehicle when stored at home. Secure gates not only help reduce the likelihood of thieves targeting the caravan, they make quick getaways highly unlikely. If you’re not looking to spend thousands on new gates, simply adding a stronger new padlock to existing gates could work wonders. Secure gates and posts can also reduce your insurance premium in the form of a secure caravan storage discount – see the caravan discounts page for details. 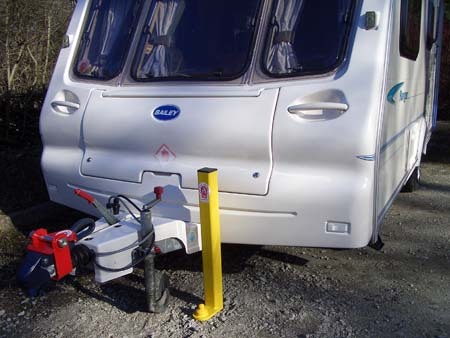 Although posts, gates and wheel clamps can help prevent theft, we still hear from customers who have had their caravan stolen despite having this security in place – in some cases gates were lifted using bolt croppers and crow bars. If you’re one of these people and/or you want to further improve security, it’s always worth looking at other ways to stay secure. Installing a security light could be an option for you. 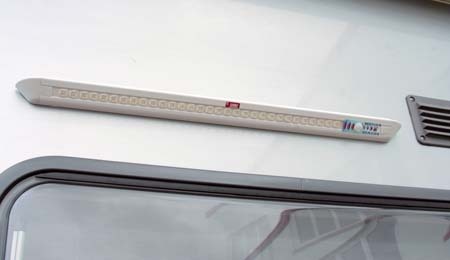 Sensored lights help to detect trespassers and are an effective way to deter thieves. Fitting security lighting is a great way to expose thieves as they come on to the property and when they’re in action! Most caravan security lights are fitted with a motion sensor and if the vehicle’s owner is away from home, lighting makes it easier for neighbours to spot any suspicious activity. Alarm systems work in a similar way to security lighting and again are a great way of tackling theft as and when it happens. We offer a 5% caravan insurance discount to policyholders who have an alarm fitted. For those of you who want to spend a little more on security at home, monitored tracking devices provide a sophisticated way of ensuring your caravan’s safety. 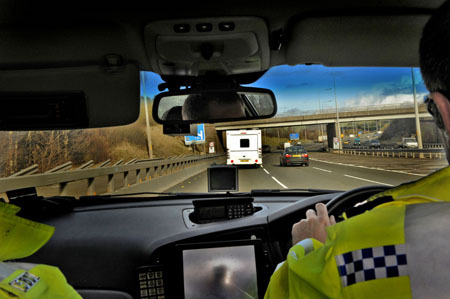 Trackers are incredibly discreet – even though they don’t stop thieves targeting the caravan, they allow the police to locate it should it ever be stolen. Fitting a tracker to your caravan also means that you can enjoy a 15% discount – see our caravan tracker security page for details. Remember like your car, your caravan is at risk whilst parked outside your home. Naturally these risks vary depending on exactly how the vehicle is stored. If for example, you park your caravan on an easily-accessible driveway with little security, you’re more likely to fall victim to theft, attempted theft or vandalism. That’s why investing in security at home really is money well spent – it means you can do your bit to protect your caravan for a fraction of what it cost. Do you have any hints on tips on security at home? Or perhaps you’ve had your caravan stolen from home in the past? We would love to hear your thoughts and stories. Simply fill in the comment box below to get in touch. Having kept my van on the drive for many years, and having hithlock and wheelclamp on it and behing locked gates, it was stolen in April 2013 at 10.30 in the morning by being lifted onto a lorry that had a crane attached, so the security devices were rendered useless. My new van now has massive chains as well as Alko wheel and hitch locks and an alarm, chains go over the axle and chassis and are attached to a ground achor in the centre of the drive, with high security padlocks. A pain to undo it all when we go away, but rather that than finding the drive empty again, a terrible feeling. Also had hassle agreeing the insurance settlement because they would not pay the amount that the van was worth on the open market. [ Not Caravan Guard I hasten to add] Now have an agreed value on my new policy, so regardless of market values I get the agreed amount that it’s worth, to replace with the same type. Hi Paul, sorry to hear that. It just goes to show how thieves can strike at any time. It seems as though you’ve invested a lot in new security so hopefully you’re caravan is safe and secure. Some years ago I found a motion activated security light which also has a unit which can be plugged into any 13 amp socket – when motion outside is sensed either night or day, the internal unit sounds a “ding-dong” which obviously alerts us. The sensitivity can be adjusted to reduce activation by cats or dogs. Several times this has wakened us in the middle of the night to see 1 or 2 people around our cars or caravan – they quickly depart when they realize we are awake. It’s amazing how well secure lighting works – and shocking how popular caravans can be to thieves! Glad to hear it’s working so well for you. Remove the wheels and fit a JSB Hublock (or 2 if double axle) to one side and JSB stands as winter wheels. This is the only reliable way of protecting your caravan with complete confidence in my opinion. No, I am not linked to this company but am a great advocate of this product. It really works and with locking wheel nuts they simply cannot be removed by anyone else (not even with reverse thread techniques used by the trade). This product is so good it should be worthy of significant insurance discount in my opinion. I Have our Van Parked Up side my house on a concreat drive,its got chains bolted through the concreat drive and wrapped around the rear chasy,Alco wheel clamps 2 on the wheels,it also has to be put in the drive by the moter mover,its about 8 inches off the gable wall,its got 2 security locks on the towing hitch, and its got a Tracker fitted by the Manafacturers of the chasy ALCO,AND YOUR WRIGHT THIEVES DONT LIKE LIGHTS DO THEY,500wats of quarts day light shine down from heavan haliluya,sorry about the spellings LOL……………. It may be worth mentioning that when you put your ‘van away for the winter (on your driveway) it ‘s so easy to remove the wheels and store them elswhere !. And it also helps to have your towcar parked in front of the ‘van as the thieves would need to remove that before getting access to the ‘van. This has worked for me for a good while, and I see no reason to change. Good idea to remove the wheels. Seems a popular suggestion. A towcar parked in front of the caravan is a good barrier to theft, although it oviously can’t be relied on as a barrier when the car is being used independently. Theives can strike at any time. We had our garage converted to accept the height of our caravan. The garage also has an electric door adding to security. Not only does it provide secure storage but it protects our pride and joy against the elements. We recently bought a new high spec van to replace our 32 year old Abbey which was in really good dry condition. The cost of the garage conversion has been easily recouped in lack of storage fees, peace of mind security and the prolonged life of our holiday home. Maurice, keeping your caravan in a locked garage is certainly one of the most secure storage options and as you say protects your caravan from the weather. It sounds like it really paid dividends when it came to the condition of your Abbey caravan. I guess garaging is not an option for every caravan owner though. If owners are worried about their caravan being affected by the elements whilst outside in storage they could check out last month’s blog post which discusses caravan covers. Bob – taking the wheels off is a good idea to stop caravan theft whilst in storage. Do many caravan owners still use caravan winter wheels like these? I park My Van on My frontage of the property, But it can only be removed by using the motor mover as it is about 18 inches from the property wall across the Bay window and around 18 inch lower than the pavement, it is also fitted with a wheel clamp and I remove the Jockey Wheel and finally it has a cctv camera watching it. It’s great to hear about the lengths you have gone to protect your caravan from theives whilst in storage. Like Dan you’re making it really hard for thieves to access your caravan by using your motor mover to get it into a tight spot. CCTV is also a good deterrent. We want to hear what other caravan owners do to protect their caravan in winter storage. If you have a motor mover on your caravan then drive the caravan on to your drive A frame end first as it’s much harder for a thief to tow away quickly. So I’m pretty confident that know one will steal our caravan. It’s a good tip to have the caravan A Frame pointing up the drive and then having the posts at the rear. The alarm will get you a caravan insurance discount. You’re really making life difficult for any potential caravan thieves which is great. So how about the other 74% of thefts or attempted thefts? Let us have the full picture please! Thanks for getting in touch. This article focuses on caravan security at home and the statistics shown here relate to that. We prefer to tackle one topic at a time to avoid having lots of varied stats in a single article. We report on claim patterns regularly so it’s worth checking for similar stories either here on the blog, in the e-magazine or on our social media pages. Stewart – you would certainly think they make the job a lot harder for the thieves. It’s not completely unheard of the thieves coming equipped with a set of wheels to steal a caravan which has had wheels removed but I’m sure most thieves would turn their attention to an easier target.